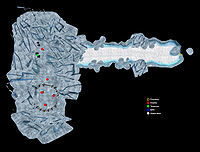 Frossel is a system of ice caves located southeast of Skaal Village, on the northeastern corner of the Felsaad Coast. 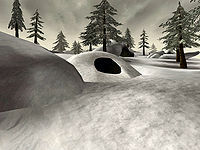 Frossel is presumed to have originally been a temporary settlement for a group of thieves operating in Solstheim. Inside is a pen for Tusked Bristleback that the thieves were presumed to be living on while in Solstheim. After pulling off a jewelry heist, the thieves hid the treasure in the Fjell ice caves and prepared to go in their separate directions. While inside the pen, two or more thieves were killed by the bristlebacks, one could possibly be Borogon due to the note the corpse held. The cave is now home to Rieklings, who use the cave as an underground breeding area for bristleback mounts. The cave itself only contains minor loot like some Nordic weapons and armor, liquor, gold, lockpicks, repair hammers and some magical weapons and apparel. Frossel also appears as a part of the Dragonborn add-on to Skyrim. This page was last modified on 19 October 2018, at 21:00.